He wrestled along side such greats as "Nature Boy" Buddy Rogers, Gene Kiniski, Bob Orton, Dizzy Davis, Freddie Blassie, Rikidozan, Rip Hawk, Art Nielson, "Whipper" Watson, Mike Dibiase, and Lou Thesz among many others. Whilst facing such opponents as Wilbur Snyder, Sandor Szabo, Bobo Brazil, Lord James Blears, Warren Bockwinkel, Ray Eckhert and Joe Blanchard some of the names who he teamed with. He debuted sometime in the mid-to-late 1930s and appeared in states all across America, including: Kansas, Texas, Georgia, Hawaii, Missouri and California. But it was in the early 1950s when he gained his most notoriety and fame when he covered up his face and rechristened himself as the Great Bolo, yes this made him original Great Bolo. The transformation happened is Los Angeles, California and he built up quite a name for himself over the course of the next several years. On February 7, 1957 he defeated the patriarch of the Funk family for the NWA North American Heavyweight Championship (Amarillo Version). He also beat Funk seven days later for the NWA Southwest Championship (Amarillo Version). Only to lose both titles back to Funk fourteen days later. By the time that happened Lovelock had solidified himself as one of the top draws in the southern states. His popularity only continued to reach higher levels as he took on a protege by the name of Tom Renesto. He named Renesto Mighty Bolo and the two wrestler together as a tag-team. Although they both still wrestled solo. 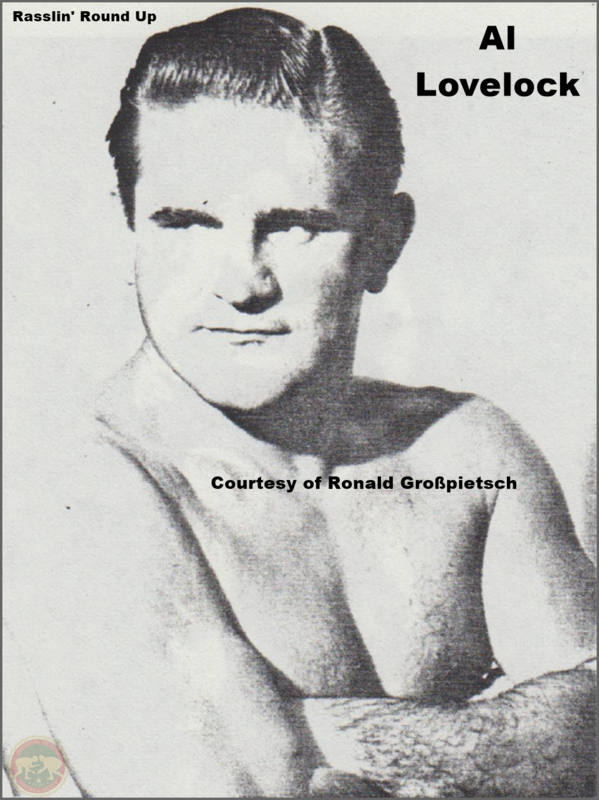 His downfall came when in 1960 the Bolo name was in such demand nationwide he sent Tom Renesto in his place to Mid-Atlantic where Tom stayed as the Great Bolo until 1964. The plan was the pair could capitalize on the money off of the name, or at least Lovelock thought he was going to gain by sending Tom out instead of going himself. But as Renesto's success took off in Mid-Atlantic Al Lovelock found himself wanting a piece of the pie that he effectively created. He suffered defeat in the lawsuit courtroom though. Feeling cheated out of his own character, he continued as the Great Bolo recruiting a new Mighty Bolo by the name of Pepper Martin. The two saw moderate success down south, but never really gathered the attention of Tom Renesto's version with the addition of Jody Hamilton as his Mighty Bolo. Many different places indicate he was active up until the late 1960s, and around 1966 or 1967 he began to train Man Mountain Mike, until his eventual debut in late '67. After that there is absolutely no record of what happened to Allen Lovelock. So little is known about this man due to his own creation being improved upon by his own protege, it is a real shame. Some sites list him as being deceased, but they support no date of death or any source for stating he is - he likely is by this point in time.